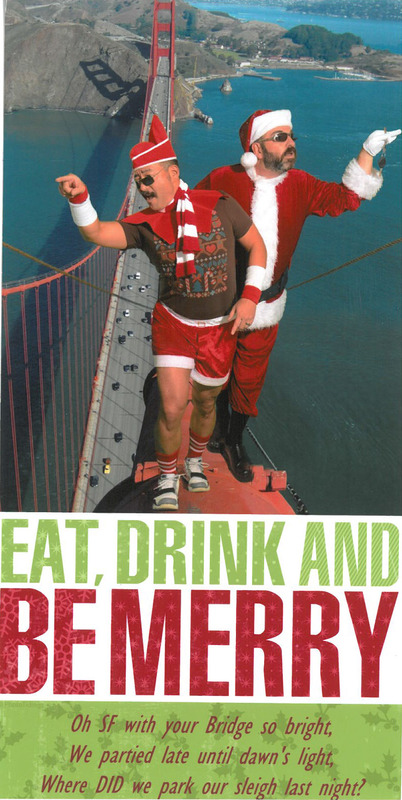 If It's Hip, It's Here (Archives): Meet Two Lovable Guys Who Don Gay Apparel In Some Very Pun-ny Christmas Cards. 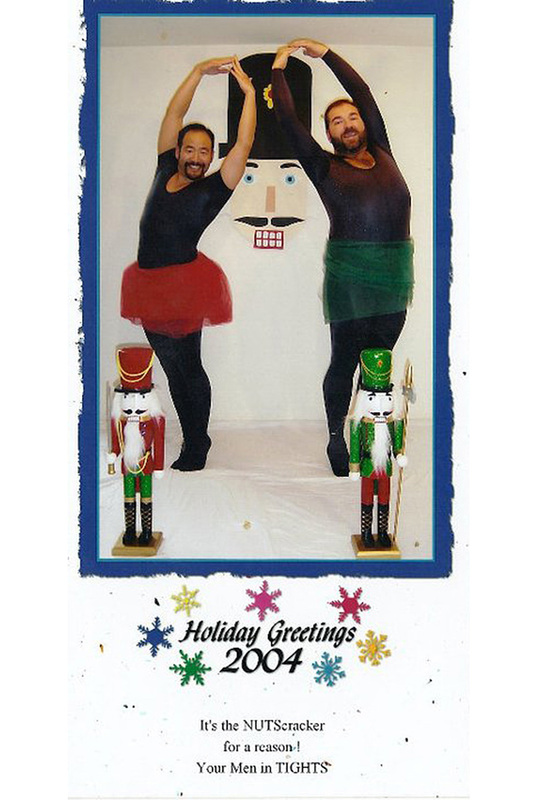 Meet Two Lovable Guys Who Don Gay Apparel In Some Very Pun-ny Christmas Cards. 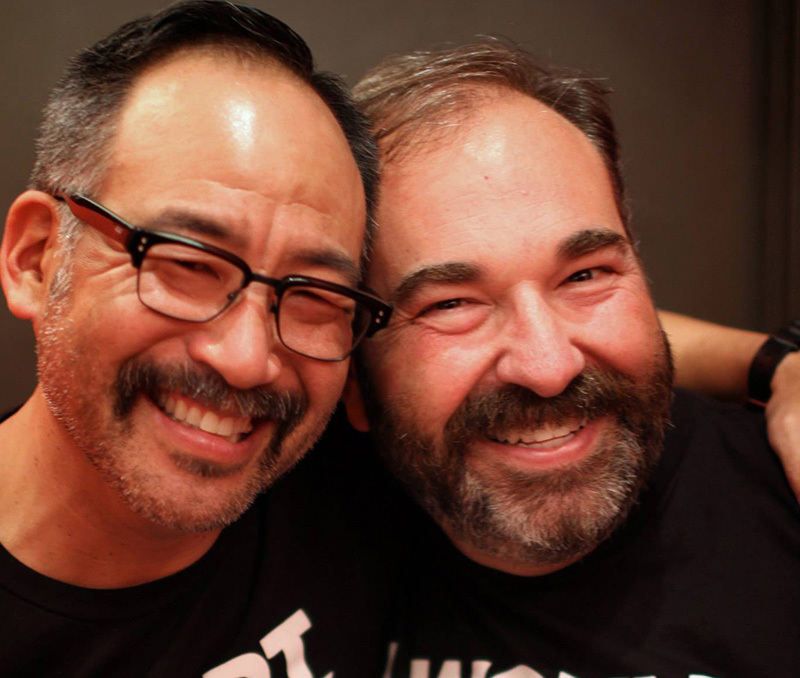 Although Bill Bowersock Jr. and Gregg Higuchi met in the Le Marais neighborhood in Paris in 1997, they soon learned they actually lived less then two miles away from each other in San Francisco. A coincidence that turned out to benefit them and, as you'll see from this post, anyone on their annual Christmas Card mailing list. 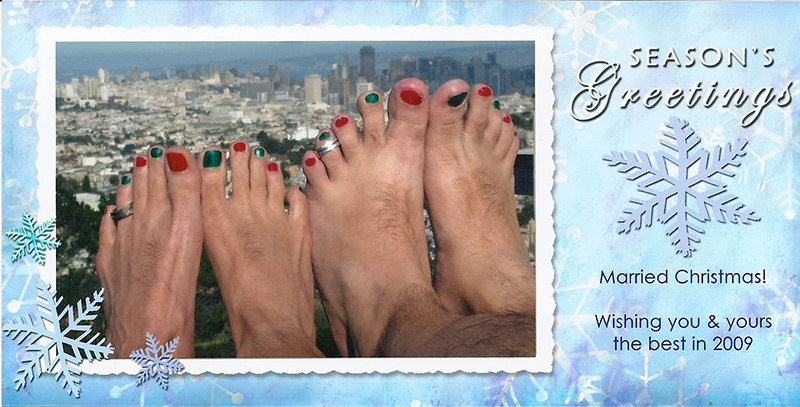 After a five year friendship, the two San Franciscans (who are now legally and happily wed) began dating and their tradition of sending out humorous holiday cards was born. 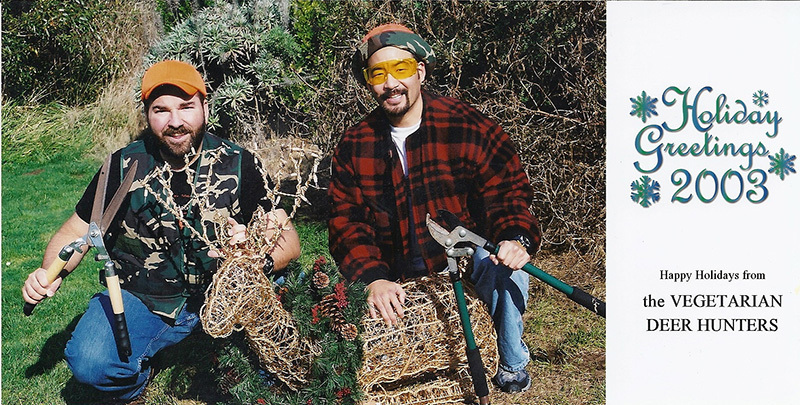 That was the beginning of their pun-driven, tongue-in-cheek holiday cards that tap into some funny takes on Christmas Culture, from being Vegetarian Deer Hunters to chefs wishing you a Happy Hollandaise. Each year since they have executed a different theme - from "Christmas Mime is Here" to "Silent Knight, Holey Knight" to " 'twas the Twilight before Christmas." 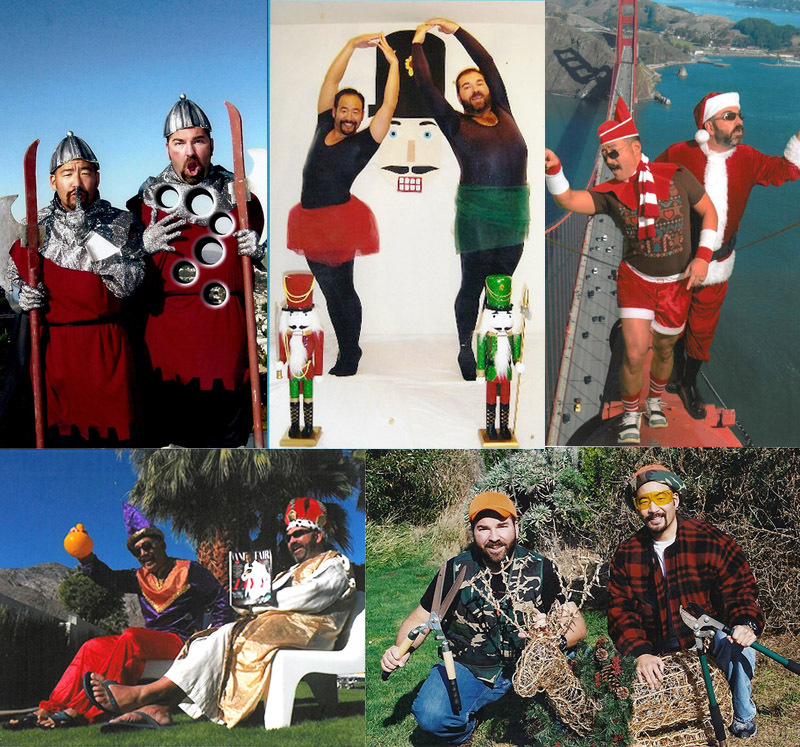 In 2011, Bill & Gregg were included in a December article in the San Francisco Chronicle by Alec Scott on "Cardies", people who create their own usual holiday cards. 2010, "'twas the TWILIGHT before Christmas ~ are you Team Santa or Team Claws?" 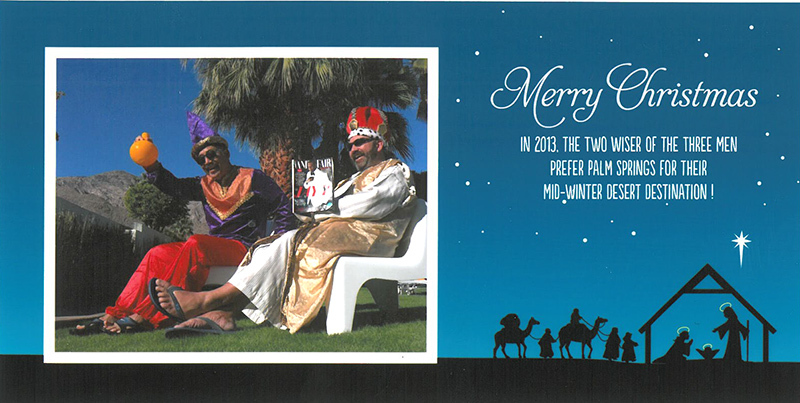 above: This year's card proves that they are truly wise men, opting for Palm Springs as their mid-winter desert destination. 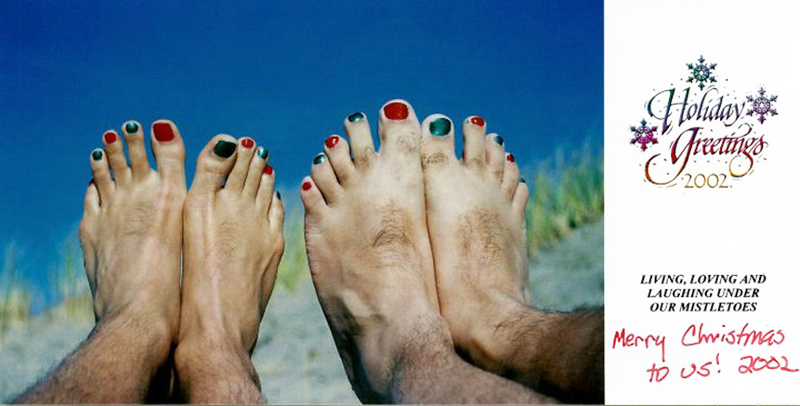 "We talk through several ideas throughout the year, keeping a running list," says Bill, on behalf of the two. "Our default conversation topic is often, What should our card be this year? We have a lot of fun planning our Christmas cards." 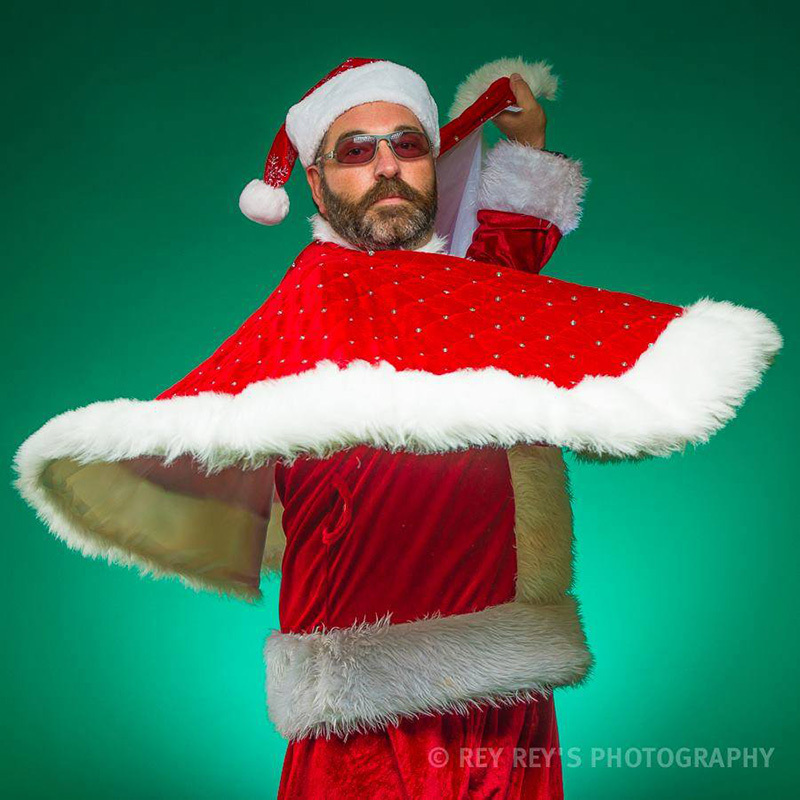 A true Holiday Ham, I had to include this recent photo of Bill by Rey Rey's Photography donning a Christmas Tree skirt as a cape despite it not being one of their annual cards because.... well, it's fabulous. Full disclosure is that I've known Bill Bowersock Jr. for over 30 years now and he's one of the brightest, kindest, most generous human beings on the planet. Friends of Bill and Gregg heartily agree. Great post, Laura! 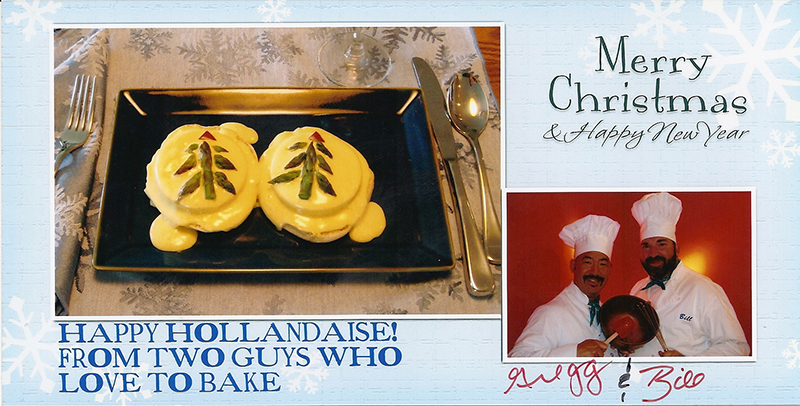 It is always a highlight do the season to see what Bill and Gregg come up with! Great post, Laura! 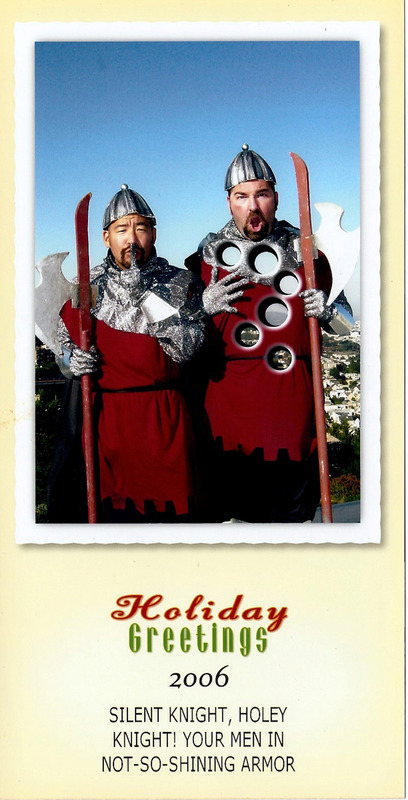 Bill and Gregg's card is always a highlight of the season.